Buffalo Alice is a rather odd name for a restaurant and bar. However, the way I see it, the odder the name, the better the food. Buffalo Alice, often called BA’s, is located downtown Sioux City. Up until a week ago, I had only heard about it because it is known as a night hangout spot for college students in the surrounding areas. However, after my lunch experience I plan on making this a regular spot when heading out for a lunch date. The main item on the menu is pizza. Pizza can be considered rather ordinary and easy to make. However, Buffalo Alice has perfected their pizza down to a science. You can order basically any type of pizza that your heart desires. The crust is a perfect crisp that accents the wonderfully blended sauce and cheese. While waiting for your food you are welcomed to munch on some delicious free popcorn. Everyone loves free stuff. Americans love pizza, beer and free stuff It is a fact of our society. 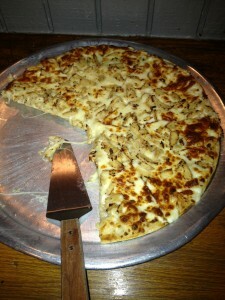 This is one of many things that make this place so popular in the Sioux land area. Getting your moneys worth is also a key factor when going out to eat in any city. No one wants to get a small pizza that cuts four slices and pay fifteen dollars for it. Buffalo Alice provides a lot of food for a reasonable price that could work its way into any budget. The atmosphere is broken into two separate segments, the bar separating the middle. Tables line the walls and you can get a prime view of the downtown area from basically about any seat. This is a wonderful area to bring large groups of people because there is a lot of seating and you can all stay together. There are a couple of televisions around the bar showing the currents sports games that are currently on the networks. This often draws in a more male generated crowd that more than often draws in a more light fun light hearted crowd. The service was more than satisfactory. While it does take a little while to get the food, sometimes it is worth the wait if the quality it going to be better. As they always say quality over quantity. The waiters were quick and helpful. Refills and frequent stops to the table were appreciated, especially when dining with a larger group of people. Buffalo Alice is a very laid back relaxed sports bar and grill that would be great any night of the week if you are looking for a cold one with a sizzling slice of pizza. I would however, not recommend this place for a family with little kids. It is generally not the most kid friendly. This is a hoping place for college students during the weeknights and weekends. I would highly recommend this for any young couple looking for a night out of the town. The fun and food will last for hours and I promise you will not leave hungry! Trattoria Fresco located on 416 Jackson Street on the South end of Sioux City, Iowa and was recently established and developed as a local Italian restaurant. This place is great for just a night out to get some delicious food. While this is by no means a fancy restaurant, one could go there basically wearing just about anything and have a wonderful time. Seeing as I love all kinds of pasta I decided to go with something a little more traditional considering I didn’t really know what to expect. I ended up ordering a simple chicken Alfredo dish with some garlic bread. This dish is supposed to be moist but still thick enough to stick to the noodles when you roll it up on your fork. 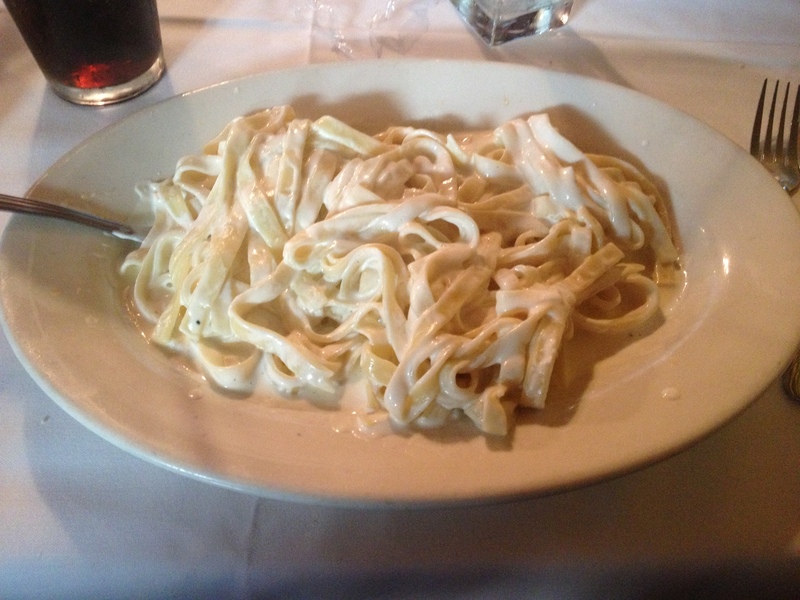 This dish at Trattoria Fresco however, was a little dry and the chicken to noodle ratio was not satisfactory. I cannot say that the dish was bad; it was not unpleasant by any means. It was simply just not the best that I have ever had. Alfredo – They had to bring the chicken out minutes later. Large groups of people can often be hard to accommodate. One of the reasons is that it can be difficult to converse if the restaurants are loud and noisy. The ambience is quaint and makes it very easy to visit with the group that you accompanied. While this is a hide away place, it can sometimes be difficult to find or even sometimes hear about. One positive was that the owner often circles the restaurant to check up on customers to make sure their visit is going to end in the best possible outcome for both ends of the spectrum. This is mentioned in several reviews of the restaurant. I think it is very important that the management sees first hand what is going on within the walls of the restaurant. This truly can help make a good food establishment a great one. Another turnoff from the restaurant was the prices. While prices can vary from restaurant to restaurant, one would expect a network like this to be a little lower than an establishment such as olive garden. On a more positive note this was a very gracious and accommodating restaurateur that I have ever come into contact with in a long while. 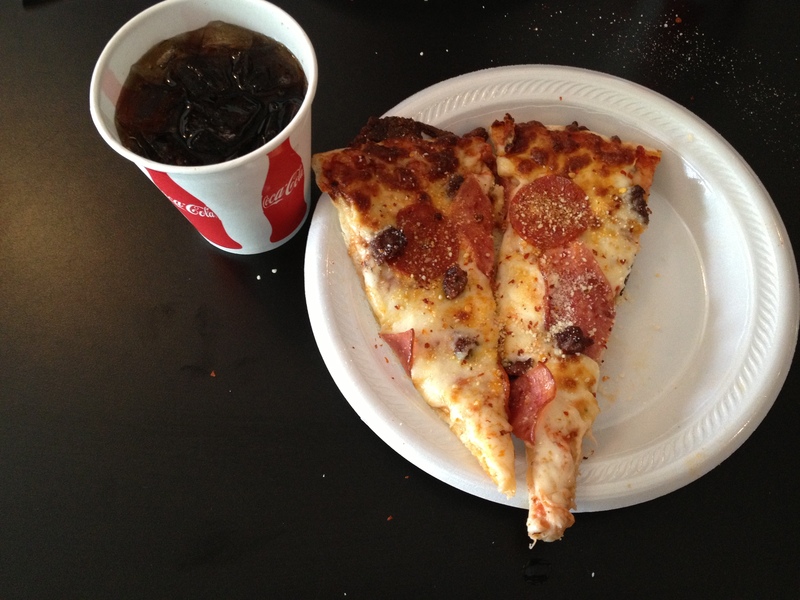 The service was personable and the response time to refill drinks and take orders was more than satisfactory. The outside of the restaurant has a side of uniqueness that tells you instantly that this is not a normal American restaurant. Any individual could tell walking up that this was something other than an American establishment. The inside of the restaurant is full of various colors to grab ones attention to the atmosphere surrounding them. Overall, this is a very good quick stop if you are looking for some decent Italian food. It is a family friendly, kid friendly restaurant that is more than accommodating in any type of situation. While my dish was not over the top, I think anyone could enjoy a wonderful night out for some good Italian grub at Trattoria Fresco! Even if you are not adventurous when it comes to your eating habits, this is a place where you can find something for you! 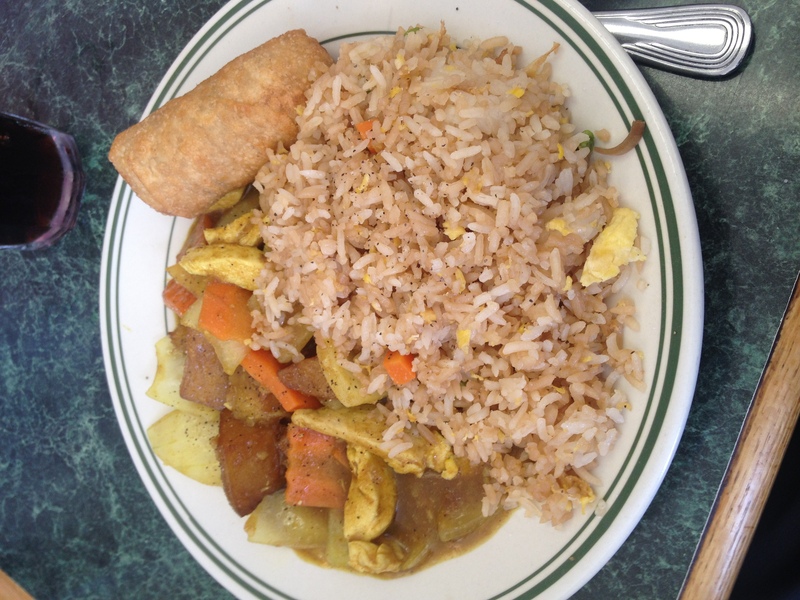 Diamond Thai Cuisine is a Thai, Asian, and Vegetarian restaurant that has been my favorite by far throughout this entire Siouxland. There is such a variety of dishes to pick from on the menu that you can honestly never be disappointed. Not only is the food to die for, the service of the waiters is impeccable. These were some of the friendliest heartwarming individuals that I have ever come in counter with since starting this journey throughout the city. Don’t let the location of this hole in the wall restaurant throw you for a loop. This is a classy place that will treat you right for a good reasonable price. Not only will the inside of the restaurant surprise you, but also the feeling that you leave with will change all eating experiences for you forever. The right kind and type of spice is what can really set a meal apart from another. Perfectly the mixture is something that Diamond Thai has nailed. While it was difficult to chose something for lunch because of all the different options that were provided, Green curry chicken is what I chose off the menu last Wednesday. It featured chunks of tender chicken simmered in a homemade green curry sauce along with healthy vegetables. 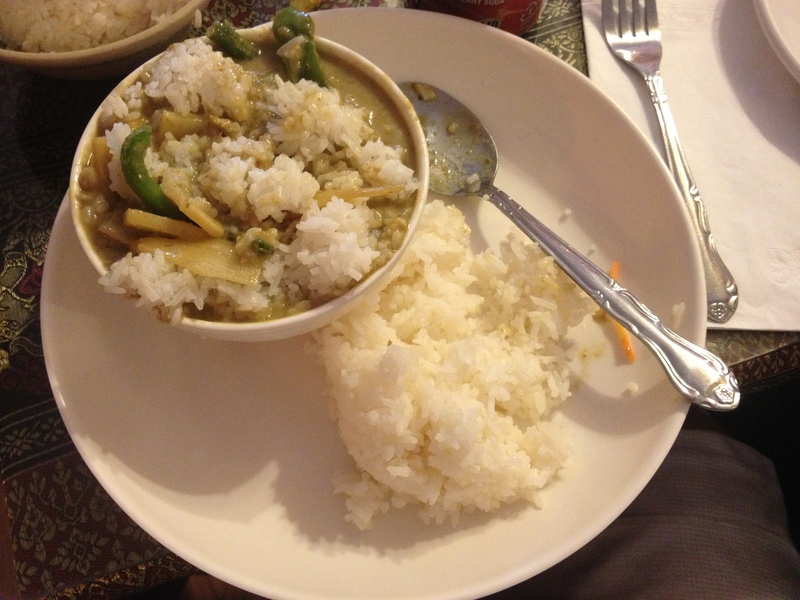 The result is a gourmet-style Thai green curry that is very aromatic and beautiful when served. When making a dish this complex it is important to have a good green curry is not only using the right ingredients, but knowing when and how to add them. Curry is made on the stovetop, and it is recommended that one cooks them in smaller pieces so they cook evenly to perfection. I believe that all of these steps and tips were taken into account when Diamond Thai went through the process of making my dish for lunch. It was simply the best green curry chicken that I have ever tasted. Seeing as the preparation for a dish like this could be quite extensive, the food came at a reasonable time. While waiting our drinks were filled without having to wait or even ask for more. The atmosphere is also something that was exceptionally unique that set the whole experience over the top wonderful. The colors simply popped out of the walls in a way that would ascent a perfect meal any night of the week. Overall I would rate this restaurant as one of the best in Sioux City, Iowa when it comes down to exotic nontraditional foods. This opened a whole new world to my taste buds and will raise the expectations of other Thai places forever in the Tri-State area and I would highly recommend taking a night out of anyone’s week to pay this place a visit. I promise you this will be a regular spot for you and your family to go on a night out. Tokyo Japanese Steakhouse and Sushi Bar. For starters, nothing in the name of the restaurant sounds even a little bit revaluating. This is a very unique restaurant based on fulfilling the hunger of basically about anything. The environment, food and service are really all extraordinary. Chef cooking all the meats and vegetables on the grill right in front of the customers. The most unique quality about the restaurant Japanese Steakhouse was the environment. This is mainly because it is what has your attention the longest. It is the first thing you are exposed to when you walk in, the area you observe while you are sitting down, and what puts the experience over the top during the entire meal. You are first seated in a semi circle area around a grill with numerous people. This may be a large group of people that you know, or some strangers that came for the same meal. The atmosphere is also complimented by the various colors of both the walls and the food. The food is absolutely to die for. You have such a large variety of options that you could basically get anything you were craving on any given night. I however, ordered fried rice sukiyaki, sirloin steak with some chicken as well. The steak had such flavor that it is difficult to even match adjectives to. The food is grilled directly in front of you, so you know exactly what you are getting, no exceptions. The steak is grilled to a crisp perfection that is wonderfully accented by the fried rice that is not too moist but not too dry. The egg rolls were crispy and delicious. What really puts this restaurant over the top is the service. At a normal restaurant you get seated, order your food and wait until it is brought out to you. 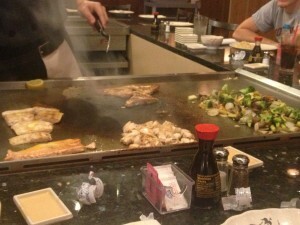 At the Tokyo Japanese Steakhouse however, you get to see the entire process. After you order you get to watch your food along with everyone at the tables get grilled to your liking. While coming with large groups would obviously extend the amount of time that one might spend in the restaurant, it is time worth spent. Another bonus is that you get your moneys worth. Small portions of food are simply unheard of at this particular restaurant. The money is the only item that could be discussed in a somewhat negative manner. It is a bit pricy and in todays economy that can mean everything. However, you do get your moneys worth of food. On a brighter note, if you go during the lunch hour, it is anywhere from three to four dollars cheaper than if one were to dine during the evening hour. All in all I would not have a single bad word to say about this food establishment. It is such a fun atmosphere, and its fun to watch the chef really go over the top to make it a fun light hearted experience. I would highly recommend this restaurant to anyone looking for wonderful food that will get you full and satisfied. This a must go to place! DaQao Restaurant on West 7th Street is a Thai based established food restaurant. One review I read online about DaQao says, “I give this place 5 stars for being in Sioux City Iowa and having a lot of flavor. Great food, served fast by a super friendly staff who are always willing to explain what menu items are and how to eat it. Lemongrass and Ginger chicken plates are absolute must try’s.” This review gave me high hopes that this place would leave me with good results. However, the reviews were misleading. 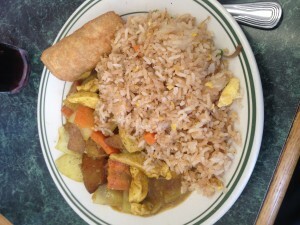 Yellow chicken curry, white rice and egg roll. In my dish I tasted chicken with little seasoning and no zest whatsoever. The rice seemed like it could have been from any box that I could have made at home myself. In any other restaurant this would sound like an over the top delicious meal. At DaQao however, the situation was a little bit different. The meal was bland and like many things I could get at any other food establishment. Disappointment comes in many forms, this kind however, was the disappointment of getting ones hopes up and letting them fall down. While the food was not unpleasant to eat, it was nothing special that would stand out in my memory. Others got various others got different dishes than I did; several near me said it was decent but nothing extraordinary. All were different versions of Vietnamese dishes that should have been something unlike anything our taste buds have ever come into contact with. Often when I am looking to eat something more exotic, I am looking for something hot and zesty, and I got regular chicken topped with some rice. The food however, was the only disappointment because other aspects of DaQao makes up for what they lack in the food department. Service was quick and friendly, leaving little room for error. The waiters were eager to take your order and help you find and taste whatever mood your taste buds were in for! If you did not understand a certain item on the menu they were willing to explain it thoroughly without hesitation. The atmosphere was another area in which they could improve by great lengths. Tables and chairs are the basics to any establishment. There is not much more that I could say to describe it. This could have been any restaurant in any city and one would have not thought it as anything special. There was not much color to the walls of the restaurant leaving the impression that they didn’t put much thought or effort into it. While the experience was pleasant I would not recommend going to DaQao if you are looking for something out of the ordinary. This is a restaurant that does not test your comfort levels when it comes to tastes new worlds of foods. While some aspects of the food establishment were wonderful, the negatives weighed heavier than the positives during my experience. Overall I would rate the experience as average. Fourth Street, Sioux City Iowa is often only known for its bars and scare parks. However, last week, I discovered a hidden secret. Rebo’s is a restaurant located near the Fourth Street bar and grill. I had never heard of this hidden secret and I was pleasantly surprised. Seeing as it is Sioux lands number one wood fire grill it all makes sense. When you first walk in you are seated by a pleasant host in a nice and quite atmosphere. When the menus arrived at the table, I was not sure what to expect. Ordering is never an easy process when you are eating a new food establishment. I finally came to the conclusion of pork loin with a side of potatoes glazed in delicious yellow cheese. This dish I chose is called the Caribbean Pork Loin with the house pot du ior. 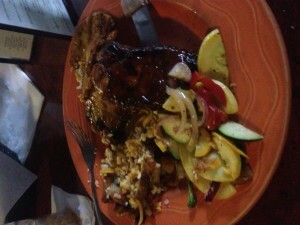 Rebos is more of a Caribbean based food and this dish represented this perfectly. Along with the pork loin, I ordered grilled pineapple. Pineapple is often a very ordinary fruit, always the same, never changing. However, Rebos grilled it to such a perfection that I will never be able to look at a normal ordinary pineapple the same ever again. Going to such a class A restaurant, one would generally not expect quick and snappy service coming in with such a large group. However, Rebos never once disappointed me. Our food was delivered at a very reasonable time of frame and the food was at its best. Everyone at the table received their food all within five minutes of each other and I had heard no complaints from anyone in our particular group. I have often heard that Rebos is most popularly known for its pizza grilled over the wood fire grill., especially on the weekends .I have been told that the pizza is like nothing you have experienced before. It stands apart from other pizzas. Crisp and zesty are the best adjectives to describe the pizza. Atmosphere is what can set one placed apart from another. Rebos is not a place you would go to sit and read a book. The lighting is rather dim, giving a customer a more of relaxed calm feeling. Because of the wood fire grill, it leaves a distinct aroma setting it apart from any another restaurant simply because of its scent. It is one of the most coveted restaurants for seating on Fourth Street. Another key point in any business is the quality of service they provide. Everyone that I had come into contact with was friendly, polite and willing to help no matter the request. Rebos would get the best of a recommendation I could give when it comes down to restaurants in the downtown area. The food, atmosphere, and service were all A plus material in my book. I guarantee that no matter the situation, or day of the week, you will not be disappointed. My experience during this lunch hour was one that I would gladly relieve any day of the week. First impressions can decide whether an outcome is positive or negative. First impressions can mean everything and sometimes they can mean nothing. Red Bones does not give the best first impression when it comes the appearance of the building. When walking by, I would never just randomly walk in and sit down to have a meal. Red Bones is located on West 7th Street in downtown Sioux City. While first expressions can be everything, mine was entirely wrong. Red Bones was overall a very positive experience, one that I would gladly relive again. Going to the same food establishment more than once would normally bore a person. However, this food network has enough on its menu to keep you wanting to come back for more for many nights to come. 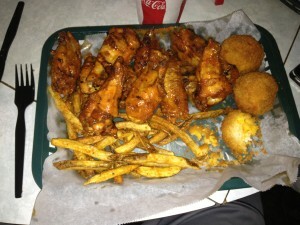 The restaurant Red Bones had a lot to offer when it comes to BQQ food. Their menu includes items like fried chicken, burgers and all sorts of BQQ products. Red Bones Burger really has no words to describe it. Any adjective thrown in its direction would not do it justice. The Red Bones burger was honestly one of the best burgers that I have ever ordered at a food establishment. 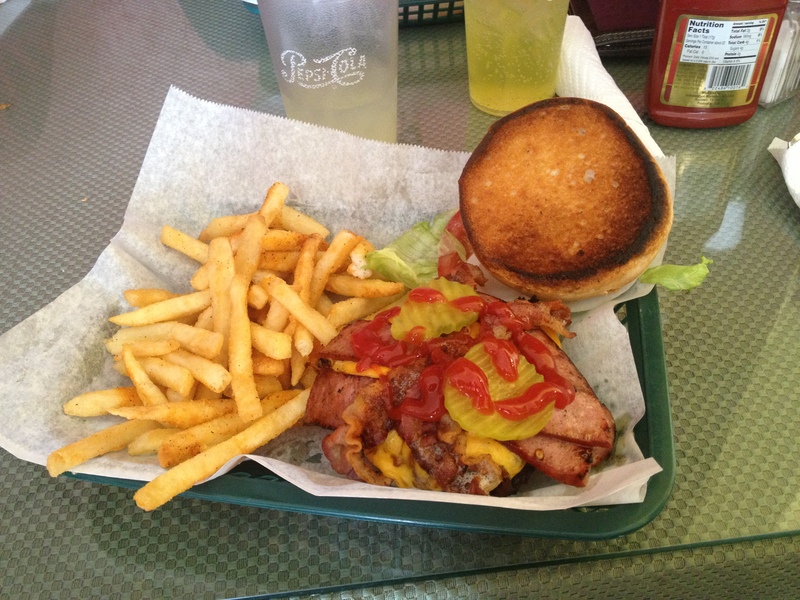 The burger was topped smoked sausage strips that gave the burger a little zing and bacon to even the whole thing out. Others around me got food such as Southern Chicken sandwich, Country Fried Chicken, and appetizers that were deep-fried. Normally, if the food is not good there will generally be lots of talking or complaining. At our table of a rather large amount, there was not a whole lot of conversation. This means that the food is good and the stomachs are getting full and satisfied. Remarkable and astounding would be adjectives I would use to describe the French fries that came as a side with the burger. Even though French fries can be such a minute part of a dinner, this really made the dinner go from good to great in a few bites. The seasoning on them reminded me of a stronger version of Lawry’s with a little more Bam! The environment was the opposite of the food. Dull and uninviting. The scenery did not draw my attention in and the walls were rather boring. The service was very friendly, warming, and welcoming. I felt as though they really wanted us to have a great eating experience for the night. While most servers would be rather annoyed having a large group of teenagers who are obviously here to judge and critic, these servers were there to serve. If you are looking for something a little different for an afternoon, try Red Bones! You will not be disappointed. This establishment simply proves that you should not judge a book by its cover before reading a few pages first. Other individuals have described the food as getting deep into their soul and they definitely were not exaggerating. This food can be an overall feeling that will raise my expectations for these types of burgers everywhere.